BAT - BLOG : BATMAN TOYS and COLLECTIBLES: THE DARK KNIGHT Batman Movie 2010 Calendar is Avaliable! 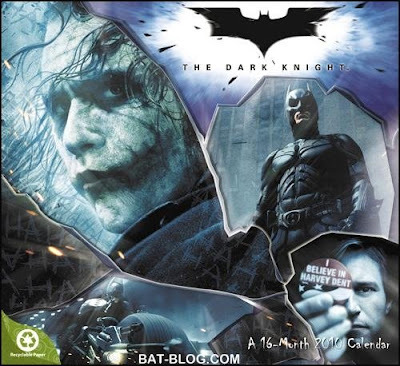 THE DARK KNIGHT Batman Movie 2010 Calendar is Avaliable! 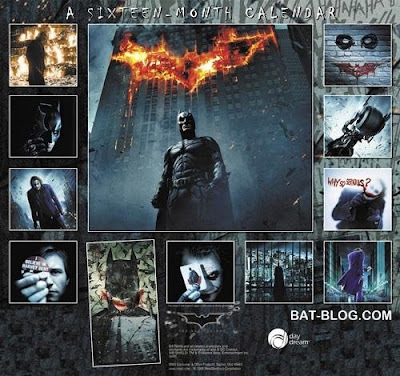 A friend of mine the other day asked me if they made a 2009 Calendar for THE DARK KNIGHT Batman Movie, that he would like to get one. I told him, "Yeah, of course, they made a few different sizes: a Regular-Size Wall Calendar, then a Larger One, & even a Small Mini-Version. I reported it on the Bat-Blog here a long time ago, didn't you read it?!" I was sort of pulling his chain because I know he does not read the site daily like most readers do & he probably missed it. Anyway, I told him about the website where you can buy them because they're kinda hard to find in most stores ( they sold out ). Well, he called me back & was sort of freaking out. While laughing he said, "They already have the 2010 DARK KNIGHT Wall Calendar available!". Now, to offer a calendar for next year is kinda weird, especially this far in advance. But what is also really strange is "why?". Why make a product for this movie way after it's not in theaters anymore? It must be because the movie is so hugely popular. I mean, think about the marketing of most Batman movies. While it is out they manufacture every conceivable product there is ( Happy Meal Toys, Toothpaste, Underwear, Cereal, Action Figures, T-Shirts, Posters, etc...) Then, as soon as the movie is over, they stop & allow the products to die out. Well, now they are offering a Batman Calendar...for NEXT year, ha ha! So, because it is current "Batman Product News" I thought I would post it here & down below is a link button if ya want to get it. The graphics do look pretty cool so I might order one for my friend. Ya know, as an inside joke, ha ha! that joker looks like Edward Scissorhands!